Obsidian pebbles from the Wiki Peak source in Wrangell-St. Elias National Park and Preserve. NPS photo by Jeff Rasic. 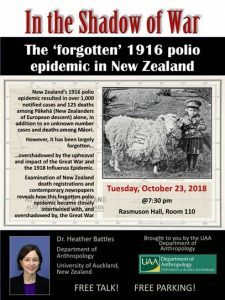 Dr. Heather Battles of the University of Auckland, New Zealand, will give a presentation on her medical anthropological research on the “forgotten” 1916 polio epidemic in New Zealand. She is visiting Alaska for the first time Oct 21-26, and will be giving this public talk on Oct 23, at 7:30 pm on UAA campus, Rasmuson Hall Room 110. Parking is free on campus starting at 7:30 pm. Dr. Battles’ work should be of interest to a wide audience – anthropologists and other social scientists, health scientists, and history buffs alike!